Girl's unfinished letter to father in Korea, 1951. Caption slip reads: "Photographer: Emery. Date: 1951-10-03. Reporter: Baker. Assignment: Girl's unfinished letter to father in Korea. 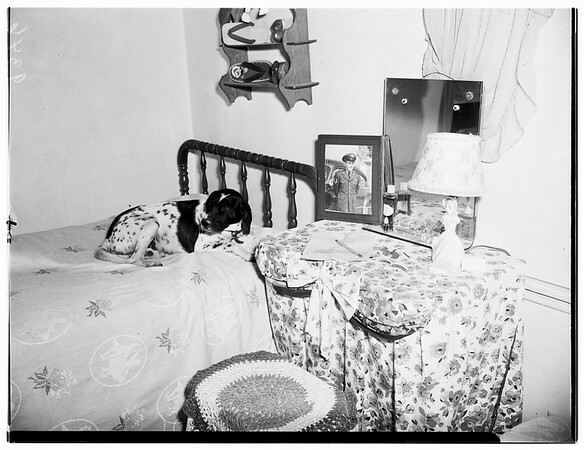 Dog Skippy by Judy's bed, with letter & father's pix on table. Copy photos: father Tech. Sgt. George Wheeler and Judy. Copy photo: Judy and Skippy. Skippy doing one of tricks Judy taught him".